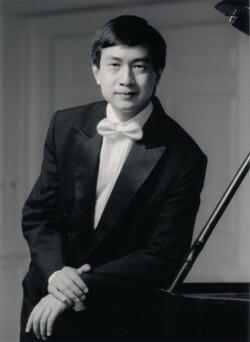 On March 14, 2009, Ren Zhang wowed audience with classical pieces by Haydn, Chopin, Moszkowski, Weber and Schubert plus two encores on the Accolades Series at The Metropolitan Museum of Art in New York City. Listen to David Dubal's comments on Ren Zhang's playing of Sinding's "Rustling of the Spring" on WQXR, "Reflections from the Keyboard". Review on Returning Recital with the Twin Cities Concert Association, Nevada City, California. Media on Opening Night Recital at the Newport Music Festival in Newport, Rhode Island. ".... The brilliance, style, and ease of the vocal line and lightness of filigree were worthy of any Golden Age pianistic giant one would think of...."
- Harris Goldsmith, "New York Concert Review"
"....rarely have I heard Balakirev's finger-breaking Islamey negotiated with such aplomb and playful indifference to its hair-raising challenges....while the Moszkowski op.72 no.11 Etude is thrown off with the kind of effrontery one more readily associates with Horowitz. Wow!" - Julian Haylock, "International Piano Magazine"
"Ren Zhang is a young pianist of enormous gifts - either playing the established repertoire, or like his hero, Shura Cherkassky, relishing the delights of the grand transcription literature. Mr. Zhang's playing in both realms is refreshing, personal, and stylish, and I believe the lamented Cherkassky would be proud of him." - David Dubal, Professor of Piano at Julliard, and author of "The Art of the Piano"
"...Ren Zhang is a very musical pianist, with a more than respectable technique..."
- Alan Becker, "American Record Guide"